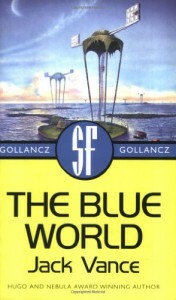 The Blue World is an longer version of Vance's novella "The Kragen". They're very similar, though the novel tells the story with a little more finesse. Essentially, Sklar Hast, one among the descendants of a crashed human ship, becomes dissatisfied and runs into trouble with the authorities. So far, standard Vance. Sklar, however, is one of the most appealing and sympathetic of Vance's characters. Not only that, but his love interest, Meril Rohan, is unusually independent. The story itself covers how Sklar and others deal with King Kragen - a giant among the native sea life. King Kragen is clearly intelligent, and it's disappointing that Vance spends virtually no time exploring that aspect of the world - not even the history of how humans and kragen first communicated. The story is in many ways not one of Vance's best, but it is among the most optimistic. Good things consistently happen to good people, and that's unusual in itself in a Vance story. As always, there's great fun with language. In this case, for example, society is stratified by caste, including Hoodwinks (who, naturally, wink hoods), Advertisermen, and Swindlers. Worth a read by anyone, and not a bad place to start with Vance. Non-serious fans won't need to read both this and the novella.